Our range of Industrial Magnets is well known for its international quality, durability, resistance to dust and pollution and reliability. Fabricated from superior quality raw materials, these magnets are extensively used in array of industries. Made in our latest technology equipped production unit by team of dedicated technicians, these magnets are highly acknowledged for its specific design, quality finish and supreme performance. Several quality tests are done to ensure world standard quality of these magnets. Backed by the profound experience in the industry, we have been able to provide the customers with a high performing range of Plate Magnet. Robustly constructed using superior grade components, the range is specifically used for separating small traces of metals from the ferrous content of the products. Our range bears a strong magnetic field that attracts the contaminating ferrous content from the material. Among the industrial separators available in the market the plate magnets that we use have a strong magnetic field that is able to sort through the product stream to attract the contaminating ferrous content in the content. Free flowing products and those conveyed by pneumatical processes or on a conveyor belt like sugar, corn, wheat, cosmetic products like minerals can have a high content of ferrous material that needs to be separated. Why waste manual hours with other handheld devices when our plate magnet equipment can be installed easily. Our expert installers can have these magnetic plates installed easily in your rectangular or sloping chutes and are even perfectly able to help when the chutes are round or vertical. The magnetic plates that we install have the high surface strength and are especially effective in sloping chutes with a very good rate of eliminating iron and other metal that can be damaging to the product as well as the consumer. 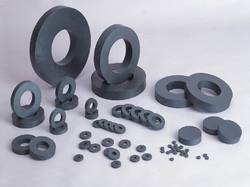 Our store offers the clients wide range of Ferrite Magnets. These magnets are prepared using strontium or barium carbonate and iron oxide at our production unit. Our offered charcoal gray ferrite magnets are available to the clients in different shapes and sizes as per their needs. Further, we offer these magnets in customized form as per the details provided by the clients for their maximum satisfaction. It can be used in temperatures up to 300 degrees C.
To meet the variegated demands of the clients, we have come up with Rare Earth Magnet. Manufactured using rare earth elements, these magnets are provided with a coating of nickel for extra firmness. 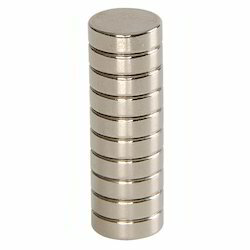 Our offered range of these rare earth magnets can be availed in different shapes and sizes as per the requirements. Smoothly finished, these products are highly appreciated by the patrons for their features like lightweight, low maintenance cost, and reliable performance. Keeping in sync with the ever-changing demands of the customers, we are engaged in putting forth an array of robustly designed High Power Rod Magnet. Manufactured in line with the universally accepted quality norms & standards, the range is widely used for separating ferrous material from varied compositions of metals. Extensively demanded in varied industrial applications, the range is widely appreciated by the client. 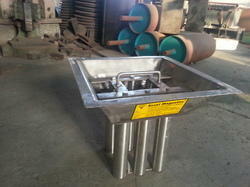 Our organization holds expertise in offering superior quality Hopper Magnet. The magnets offered by us are widely used in plastic industry. Our offered magnets help in protecting molding machinery and other processing equipment from ferrous metal. The magnets offered by us ensure simple removing of small particles ferrous metal from flow free of powder and granular material. 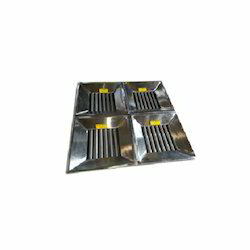 Clients can avail high-grade Grill Magnet from us. Designed to remove unwanted iron contaminants, these are provided with magnetic grills that are aligned in different angles. 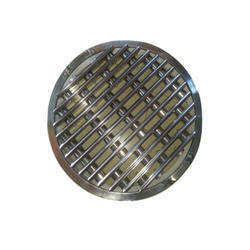 We offer these grille magnets in different specifications, sizes and shapes to the clients, to suit their varied requirements. After the production process, these magnets are rigorously examined on different parameters to ensure their compliance with international quality standards. Abiding by the ethical norms & standards of the organization, we have been successful in providing the customers with a broad array of Funnel Magnet. Incorporated with high performing stainless steel or aluminum funnels, the range is widely appreciated for high operational accuracy and durability. Further, the range is incorporated with a magnetic rod that is used for removing all iron impurities from varied liquids as they pass through the uniform gap created between the magnet & funnel. We are counted among the prominent organizations engaged in manufacturing and supplying an excellently designed array of Channel Magnet. Our range is specifically used for removing iron particles from free-flowing granular & less contaminated material. 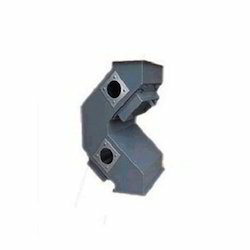 Offered in varied sizes, capacities, and specifications, the range is extensively demanded the removal of tramp iron from a material that is carried in the chute. These are magnets of regular use, with the rectangular base having a great holding strength onto one of the largest surfaces where it needs to be attached. Usually, there is a strong rubber or even ceramic magnet that sets the plate steel channel into each other with holes, loops or even the nuts for the mountings used. With the formation of strong ceramic or zinc plated steel parts, these are fixed into the steel pieces in order to create a perfect channel magnet. These also possess the strongest power on one single surface so large. 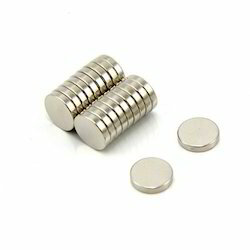 With middle holes featured for mounting these magnets, when compared to any individual magnet have more potency. Made resistant to heat, the temperature rise does not affect them. Latches of the doors need strong attraction bringing the door tightly handled where the magnet plays a good role. Plate holders in the vehicles which bear the licensed numbers are also one of the many applications. In the same way, holding the signs, banners, and blueprints are also effectively done with these channel magnets, keeping them intact or long time. Nameplates of outside your homes also need them. Strength: The strength of the magnets depends on the requirements but in general they are tested with the pull strengths and other methods availed with us so that only good quality magnets are carried forward. on us. Depending on your open choice we send in the needed colored magnets only. Packing can be in individual bags or in a set or grouping again depends on the consignment. Handle With Care: Even if they are magnets, this doesn’t mean care is not required, ample amount of concern is needed while handling them as well. The metals that attract magnets are not less in existence around while moving them as well, do mind your metallic instruments and even your hands or fingers which may get held between two strong pieces proving painful to you. We hold expertise in offering quality assured Hump Magnet. 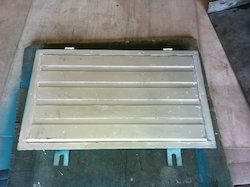 These magnets are used for separating ferrous tramp metal in gravity systems. 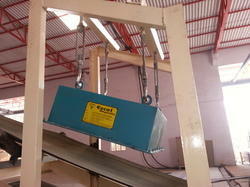 Our offered magnets are also adaptable to rectangular chute transfer lines and round pipe. The offered magnets have two heavy-duty diverters equipped spout magnets that ensure flowing of products via hump into the magnetic fields. By taking the advantage of offset flow of material, star trace humps offered by us ensure removing of maximum tramp metal from the flow of product. These magnets are manufactured using stainless steel and with welded flange mounting systems for fitting chute or pipe applications. Clients can avail these magnets in different sizes as per their requirements.